Maxwell's at the Club, located in the East Bank Club at 500 N. Kingsbury St. (telephone: 312-527-5800, ext. 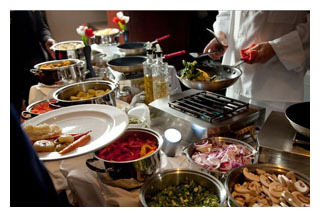 301), will present its elegant annual Easter Brunch on Sunday, April 20 from 10 a.m. to 3 p.m. The extensive buffet, which is open to the public, will feature prime rib and roast turkey carving stations, an omelet bar, a waffle bar, assorted pastries and seasonal berries, as well as a variety of appetizers, salads and entrées. The entire family will enjoy the festivities, which includes a special appearance by the Easter Bunny from 11 a.m. to 1 p.m. Because Maxwell's Easter Brunch is very popular, reservations are necessary. Reservations are required for this very popular Easter Brunch. To make reservations, pp lease call (312) 527-5800, extension 301, or schedule your table online at http://eastbankclub.com/dining/maxwells-at-the-club/events/easter-brunch/.